For the Bay Walk, start from the parking lot and walk out toward the bay. There will be a lagoon on your left at the beginning and one on both sides as you go further. At the bridge, you turn right and parallel the bay. The bridge is over the inlet to the lagoon that has been on your right. As the water goes in, the egrets and herons fish from the incoming water. Swallows rest on the rocks of the bridge. Turns will sit on the telephone in the lagoon near the bridge. It is a wonderful place to stop and enjoy the goings on. Walk over the dam and along the bay until it is time to turn around and head back to the parking lot. There will be views of flocks of birds out toward the bay as well as various species in the lagoon on your right as you walk out. 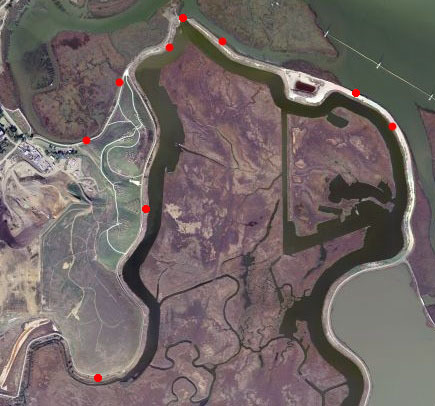 Toward the turning around point, there will be an island on your right that is resting grounds for white pelicans in the winter and other birds in other seasons. If walk far enough to take a right turn and start walking away from the bay and see a road with a gate off to your left you might see a small pole with a well worn path around it. This is the "turning around post" and it it traditional to walk around it and go back. If you have two cars and are committed to a 3 mile walk, consider leaving one car at Bixby Park and starting your walk from the Miracle Mile walk at the end of San Antino Road on Terminal Avenue.